Legislation outlining an improvement program for Interstate 81 in Virginia has been amended to exclude plans for tolls along the route. Four lawmakers introduced two identical pieces of legislation Jan. 15. The bills were revised in both the House and the Senate on Jan. 31 to omit plans for tolls as a fundraising mechanism. The bills came just over a month after the I-81 Corridor Improvement Plan was unanimously approved by the Commonwealth Transportation Board, which reviews problem areas along the route and identifies possible solutions, including financing options. 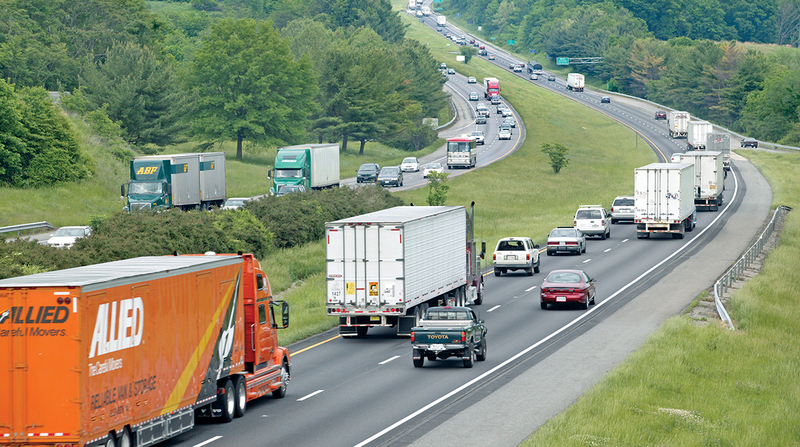 A major freight corridor, I-81 runs through Virginia for 325 miles and usually is congested. The legislation creates the I-81 Corridor Improvement Fund, a reserve for capital improvements and maintenance costs. It does not propose a funding source. Interstates 95, 66 and 495 use high-occupancy toll lanes. On Jan. 29 Gov. Ralph Northam announced projects that will extend the lanes on I-495 to the Maryland border and construct a new ramp connecting the I-95 toll lane to Potomac Mills in Woodbridge, Va. If the initial legislation’s plans advanced, the toll rate would have been imposed on vehicles Class 6 or higher and would not have exceeded 17 cents per mile, per segment of road. The revised bill also strikes plans for an annual pass program to discount tolls for passenger vehicles. The pass program stoked the ire of the trucking industry. American Trucking Associations General Counsel Jennifer Hall sent a letter to Northam on Jan. 15 expressing concern over the corridor plan, particularly because the annual pass was to be available exclusively to automobiles. More than 11 million trucks travel I-81 per year, hauling $312 billion in goods and facilitating 42% of the state’s interstate truck vehicle miles traveled. Virginia Trucking Association President Dale Bennett said tolling I-81 would not have been the most effective way to generate funds to improve the route, noting high administrative costs to maintain the toll systems. Rather, an increase to the fuel tax would be a more efficient means to raise money, he said. The excise tax rate is 16.2 cents a gallon for gasoline and 20.2 cents a gallon for diesel. “We’re willing to pay our fair share of the costs of those improvements to 81 and support an increase in the diesel fuel tax or any other options that don’t involve tolling,” Bennett said. To avoid truckers diverting to alternative routes to dodge tolls, the initial bill proposed using video monitoring and identification systems to spot those who exit before a collection point and then subsequently re-entering the interstate. Bennett said the language about the video monitoring system was dubious since the monitors can’t differentiate when truckers exit for legitimate reasons, such as delivering loads and taking meal breaks. The legislation requires the board to adopt an I-81 Corridor Improvement Program, which will allocate funds and outline schedules for projects along the route. The board will track the number and duration of traffic incidents on I-81. Annually, the board must update the program and report to the General Assembly. The bill also creates the I-81 Committee, a 15-member group that will advise the board on the improvement plan and will hold regional public meetings on funding options.